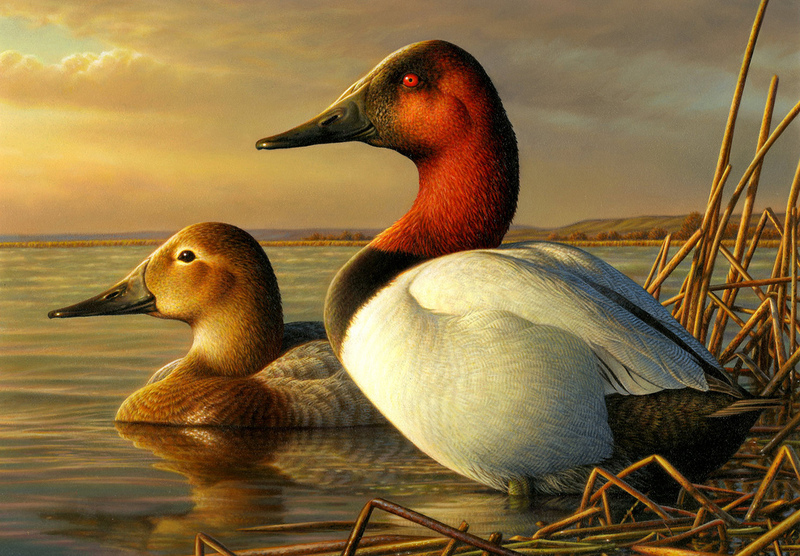 This handsome pair of Canvasbacks — painted by Adam Grimm of South Dakota — appears on the 2014-2015 Federal Migratory Bird Hunting and Conservation Stamp. Sales of the federal "Duck Stamps," a program managed by the Fish and Wildlife Service, are vital tools for wetland conservation: "ninety-eight cents out of every dollar generated by the sale of federal Duck Stamps goes directly to purchase or lease wetland habitat for protection in the National Wildlife Refuge System." View an online gallery of duck stamps since 1934 or learn more about the duck stamp program. Also, learn more about BirdNote partner, Ducks Unlimited. Support wetland conservation and buy a duck stamp now.